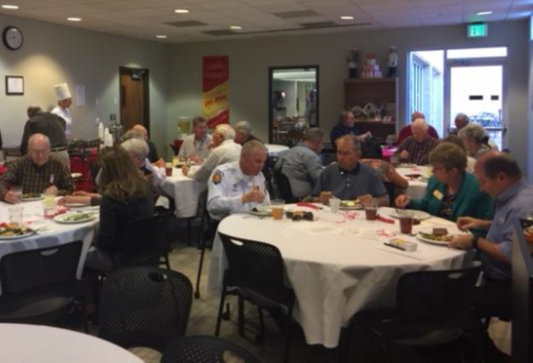 At last week’s meeting, we didn’t conduct our regular Monday luncheon at Pueblo Del Sol CC; instead we gathered at the downtown campus of Cochise College Culinary (CCC) School. Chef Laura Miller and her students planned the menu and prepared a delightful luncheon for a near capacity crowd (49) of Rotarians and guests. Planning an occasional "field trip" to a new venue is part of Rotary’s commitment to Vocational Service and supporting local businesses and vocations. Chef Laura and her students also prepared the room, marked entry points to the Culinary School located in the old hospital at Wilcox and Camino Real. President Nancy opened with the normal agenda assignments and a few business announcements before introducing Chef Laura to speak to the Rotary audience. Chef Laura Miller earned a degree in teaching but after several years teaching academic classes, she followed her true passion, baking. She owned a bake shop for several years until the then-head of CCC School and her pro-claimed mentor relentlessly tempted her to join his CCC department and to teach baking to culinary students. That was nearly eight years ago; with the past two years serving as department chair after he retired. Her passion for baking, teaching, and loving life collided to make her a true professional in all three areas. 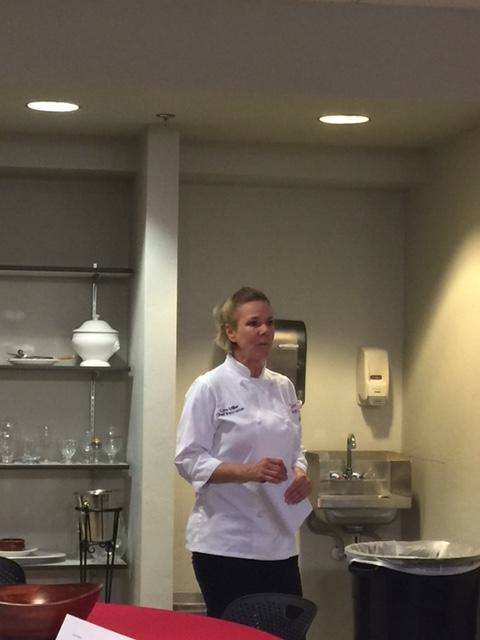 Today, forty students learn from Chef Laura and her cadre of other teachers and instructors. The result was a truly fun, informative, and delicious luncheon. Lou Kuttner asked one of many questions presented to Chef Laura, "Does the Culinary School oversee the Cafe in the Student Union?" She replied: "No, the Cafe in the downtown campus and the east campus are operated by an outside contractor due to student turnover and matriculation." After thanking Chef Laura and presenting her with gifts as the club always does for speakers and program presenters, many Rotarians toured the facility with Chef Laura and her students.